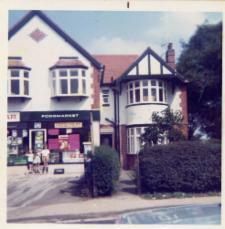 We moved to the Spar shop in the mining village of Dordon in April 1971. My dad and mum worked really long hours to make it economically viable. 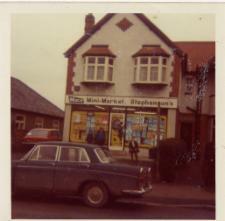 In 1974 someone came up with the idea of extending the shop. You can see how the exterior changed because of this. I am standing outside the shop with my brother and sister in the first two photos. 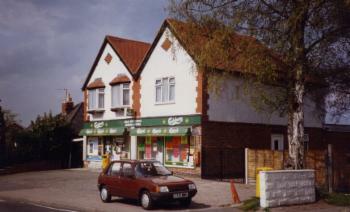 The third photo (with the Peugeot 205 on the drive) was taken on 12th May 1996. Even after the work was done, the garden was still fairly large with a few silver birch trees in it. As we were on top of the hill, the view from the back of the house was great. You could see for absolutely miles. This photo was taken on 15th February 1975. 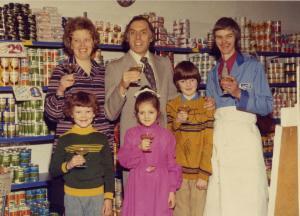 Larry Grayson had just opened the extension to my mum and dad's Mace shop in Dordon. I hope you notice all the carefully stacked tins and my lovely curly hair. This was the cortina estate car that my parents picked up goods from the wholesalers in and then made deliveries to their customers. 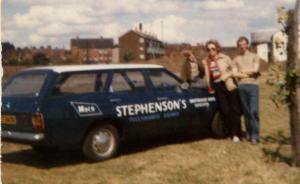 It's parked near where the UCI Cinema in Tamworth is now. We left Dordon in October 1978.